The main barn includes 24 stall ranging from 12x13 up to 12x18. There are two wide aisles and all stalls have grills on at least two sides to allow for good ventilation and for horses to see each other. The indoor arena is a full sized dressage arena (20 meters x 60 meters) and is light and airy. There is excellent lighting day and night and there is a sound system for clinic instruction and for music. 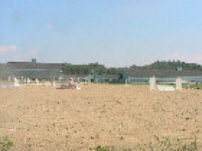 The outdoor arena is 225 ft.x 225 ft. and can accommodate a full size dressage arena and a large jumping course at the same time or 3 dressage arenas simultaneously. There are numerous cross country jumps in our jump field covering beginner novice through preliminary competitors. 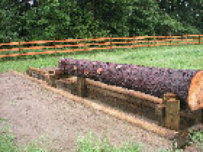 These include a ditch complex with trakehner, a bank complex, a mound with a log, and a water jump. There is generous turnout at Pirouette Farm with most horses having all-day turnout. There are 13 large (approx. 1 acre)paddocks, 4 smaller (approx.1/2 acre) paddocks, and 2 small dirt paddocks for transitioning horses to grass turnout.